Free the Children’s annual signature event, We Day, is the largest event of its kind. We Day is an educational event and the movement of our time—a movement of young people leading local and global change. 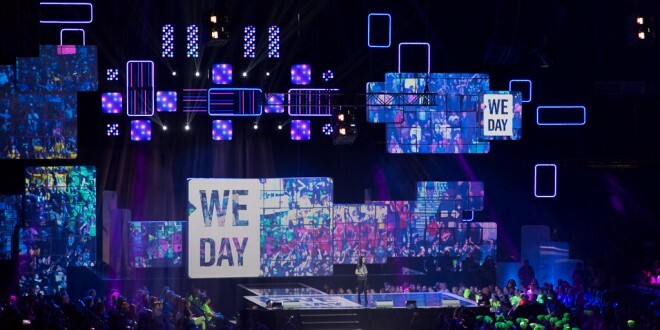 We Day is tied to the yearlong We Act program, which offers curricular resources, campaigns and materials to help turn the day’s inspiration into sustained activation. We Day connects world-renowned leaders and A-list entertainers – from Magic Johnson and Sir Richard Branson to Demi Lovato, Darren Criss, and Jennifer Hudson – together with thousands of elementary and high school students and educators in an inspirational setting to learn about some of the most pressing local and global issues of our time. We Day will be continuing its Fall 2014 tour in Saskatchewan on November 7th 2014 at the Credit Union Centre. In order to execute a flawless event, we are looking for experienced photographers to capture some of the greatest moments throughout the event. We Day runs from roughly 8am-2pm and you will be required to capture a range of requested shots in various roles all day. You will be required to provide all of your own photography equipment. If you are interested in participating , please respond with a link to your website, your first and last name, event day contact phone number and email address for further consideration. If you have any questions, please do not hesitate to reach out to Emily Humphreys at emily.humphreys@freethechildren.com or via telephone at 1.416.925.5894 ex 429.